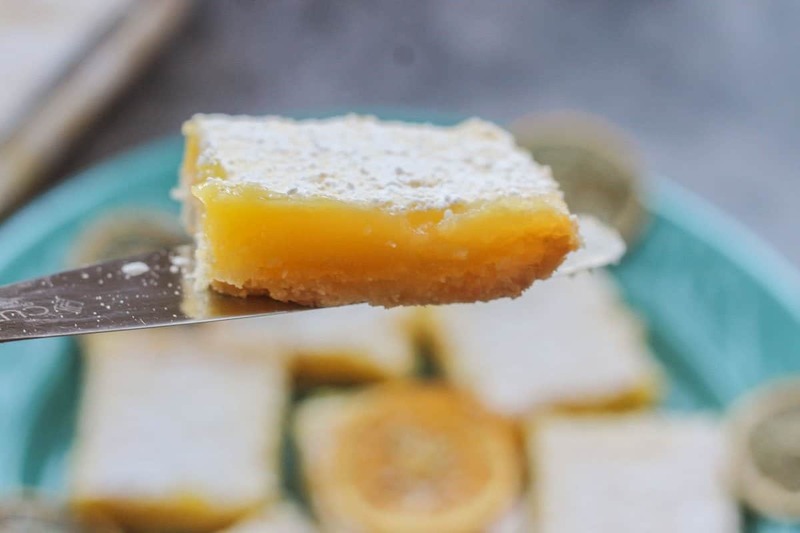 This Easy Lemon Bars Recipe will guarantee lemon bars that are tart, sweet, and simply delicious! So if you’re looking for the perfect lemon bars recipe, congratulations, you’ve found it! As the month of March rolls on, it brings us closer and closer to Scott’s retirement date. New changes are happening fast, some exciting and some scary. When Scott does retire (with 30 years of service) we’ll start spending more time in Montana, where we will be moving to within a year. Throughout the years, I’ve sent a lot of baked goods with Scott to work. Last week, Scott wanted me to bake something for his co-workers one last time. He could have asked for anything, but he chose this Easy Lemon Bars Recipe. I guess the lemon bars are a favorite among his co-workers. So this week, when we stopped by his work one last time, one of the secretaries, Amanda, told me that my lemon bars were the best she’d ever had. She asked if I could share the recipe. Luckily, this blog post was already in the works; Amanda, I dedicate this post to you! Making lemon bars couldn’t be any easier. Especially with this Easy Lemon Bars Recipe. Just make sure you get your hands on some fresh, organic lemons if possible. The measurements for the ingredients can be found in the recipe card on the bottom of the post. Mix flour, sugar, cornstarch, and salt until combined. Pour flour mixture into a food processor, then add lemon zest, and cubed butter. Pulse until the mixture becomes crumbly. Add to a greased 9×13 baking dish. Compress the mixture to create the crust. Beat eggs with an electric mixture. Add the sugar and mix until combined. Add flour, lemon zest, lemon juice, half and half, and salt. Mix until all the ingredients are incorporated. Remove crust when 20 minutes have elapsed. Pour the lemon topping mixture over the hot crust. Bake for 25 minutes longer, or until the lemon-custard is set. Cool off completely before storing in the fridge for at least an hour. Sift powdered sugar over the lemon bars before serving. Do lemon bars have to be refrigerated? Lemon bars should not be left out more than a few hours and need refrigeration. This is especially true in hot conditions. 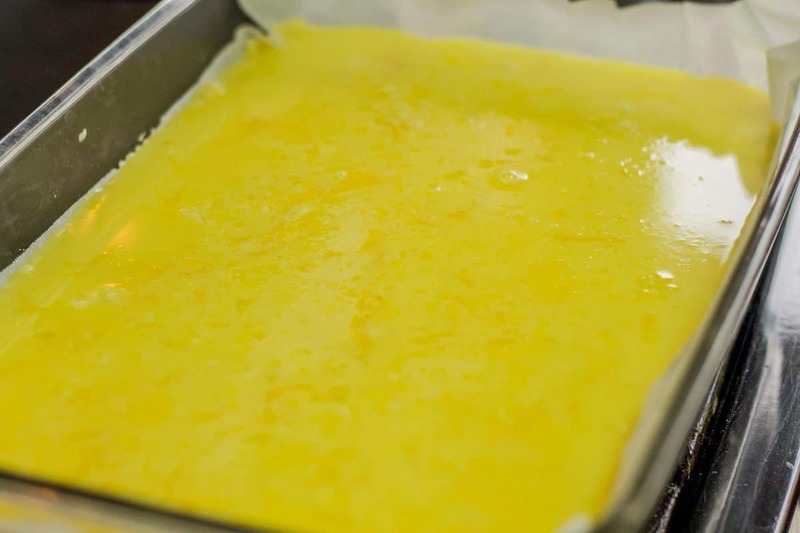 Lemon bars contain cream and eggs, just like any custard. Therefore, they should not be left out for an extended period of time. But in all honesty, they probably won’t last more than a couple of hours. Trust me, they’ll be gobbled up way sooner than that! How Long Do Lemon Bars Last in the Fridge? There are many factors that can affect how long lemon bars last in the fridge. For example, how many family members of your family have a sweet tooth? Seriously, in my house, lemon bars would never last longer than three or four days. Scott can polish off five pieces at one sitting, and call it a “Scott-sized” serving (he’s 6′ 4″). Another factor is how they are packed. Like most food, you don’t want to leave the lemon bars uncovered. 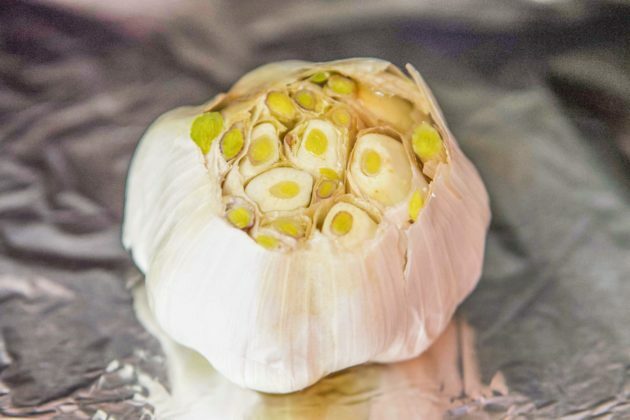 This not only dries them out but allows them to absorb other flavors in the fridge. So make sure you pack them in a sealed container, with wax paper between the layers. 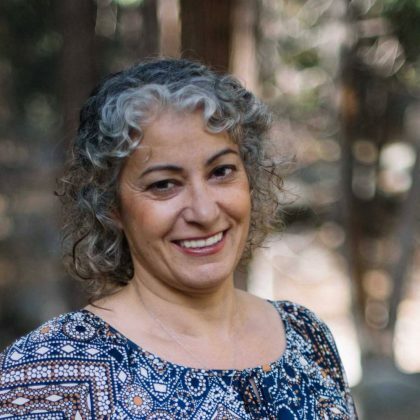 For other lemony dishes check out the following recipes: Italian Limoncello, Preserved Lemons, Easy Lemonade, and Lemony Greek Dolmathes. If you Pinterest, please pin and share this recipe! If you love this Easy Lemon Bars Recipe, please give it a 5-star rating! The best lemon bars you'll ever have, and super easy recipe to follow! Pour flour mixture into a food processor. Add lemon zest, and cubed butter. Pulse until the mixture becomes crumbly. Add to a greased 9x13 baking dish. Compress the mixture to creates the crust. You can either use your palms, or the bottom of a glass to do this. Meanwhile, beat eggs with an electric mixer. Add the sugar, and mix until combined. Bake for an additional 25 minutes, or until the lemon-custard is set. Cool off completely, then store in the fridge for at least one hour. I had my husband stop and pick up some lemons. Fingers crossed! Lemon bars are the best! I will have to eat the whole pan!